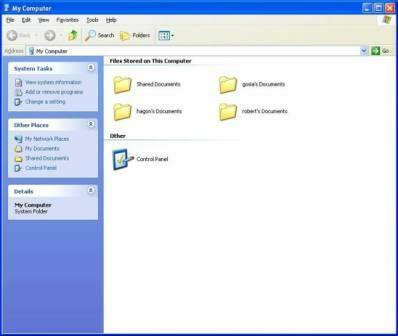 Each disk drive or partition volume of permanent built-in hard disk or plugged-in external USB portable hard disk or removable USB flash drive storage medium is a logical drive which has a visible drive letter which allows user to access the drive through Windows Explorer or My Computer. Windows operating system such as Windows 7, Windows Vista, Windows XP and Windows Server has the ability to control which drives that are visible in My Computer or Windows Explorer folder tree, by hiding and removing the selected drives or all drivers (together with their icons and drive letters) from all folder tree view of Explorer and My Computer drive listing. The invisible drives can still be accessed, opened and explored by directly typing the drive letter in Location Bar. Navigate to one of the following registry key. Right click on blank space on the right pane, select New -> DWORD (32-bit) Value to create a new REG_DWORD registry entry. Name the new registry value as NoDrives. NoDrives registry value uses a mathematical hexadecimal numeric value to define local, removable storage device and network drive visibility to determine whether to hide or show logical drive in the computer. The lower 26 bits of the 32-bit registry value are corresponding and representing drive letters from A to Z, and by setting its value to 0, the drive will be unhidden and visible, while with value of 1, the drive is hidden and invisible. For example, to hide drive C and drive D, add the numeric values of 4 (for drive C) and 8 (for drive D), which equals to 12. As such, set the value date of NoDrives to 12 to hide drive C and D from Explorer view. To make all drives hidden, set value date of NoDrives to 67108863. Restart the computer for the setting to take effect. Alternatively, there is a “NoDrives Manager” (NoDrvMan) software utility that can automatically hide Windows logical drives by modifying the registry. What user needs to do with NoDrives program is just to select and tick the drive letters to make hidden. NoDrives Manager to allow users to set a password protection to prevent unauthorized user to run the program and re-enable the hidden drives. Download NoDrives Manager from sourceforge.net. Note: The hidden drives will still appear in File Manager. To remove File Manager, delete or rename winfile.exe.